ANDOVER – A persuasive piece on why you should adopt a pet from an animal shelter received the most points, thus granting it the win as presented by Pymatuning Valley High School senior Brooke Hancock on Monday, March 18, during Andover Rotary Club’s annual 4-Way Speech contest at Scooters by the Lake. (From March 22 edition). According to Hancock, her speech helped her to gain some important skills and was appreciative of the opportunity in being part of the Rotary’s big event. Participants to the contest this year besides Hancock included junior Austin Stringfellow, who was awarded second place; senior Jenna Swiger, who was granted third place; and senior Mason Mazzaro, who was issued fourth place. Judges included Andover Public Library Director Nancy Logan, PV second-grade teacher Jo Silvers and guest John Annandono. Speech topics from these students included why the public should donate blood, the importance of insects and gun control. In order to be judged fairly students were graded on four areas: is it truth, is it fair to all concerned, will it build goodwill and better friendship, as well as will it be beneficial to all concerned with 35 percent of the grading being content, 50 percent being the delivery of it, as well as 15 percent making up the organization of the speech. Each of the winners of the 4-Way Speech Contest were awarded cash prizes, along with the chance for Hancock to attend the district 4 Way Speech Contest at Aurora High School on Saturday, April 6. Advisor Tom Mazzaro also seemed pleased, as were many of the parents such as Anita Stringfellow. In addition to holding a 4-Way speech contest, Andover Rotary Club strives in supporting the youth of the community each year through its third-grade dictionary distribution day, as well as by granting scholarships, sponsoring foreign exchange students, donating to the food bank and by supporting clean water/world peace initiatives. 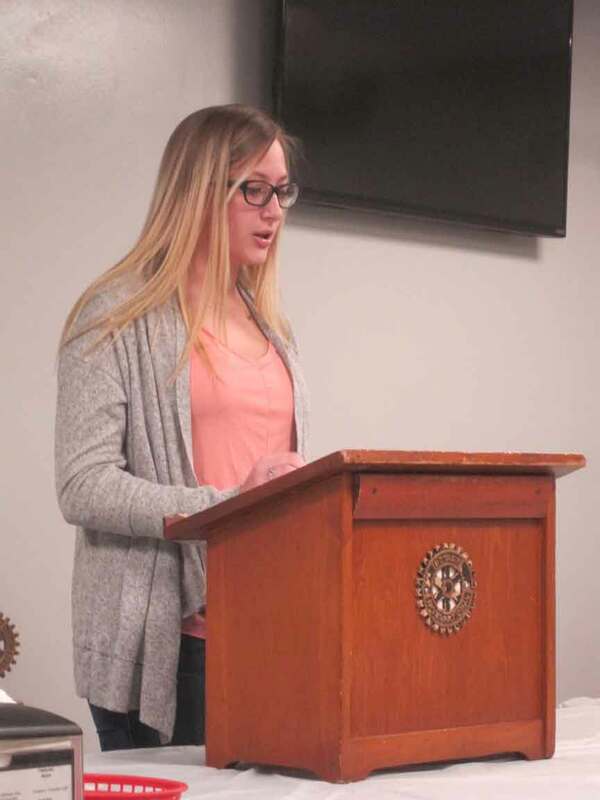 Pictured: Senior Brooke Hancock presents information on the importance of adopting a pet from an animal shelter during this year’s 4-Way Contest through Andover Rotary Club. “Think of it as giving animals a second chance that deserve a happy home,” said Hancock during her speech.